You know that old saying? It goes: "If you love something set it free. If it comes back it's yours. If not, it was never meant to be." Well, Roger Mathews is testing if it's true. 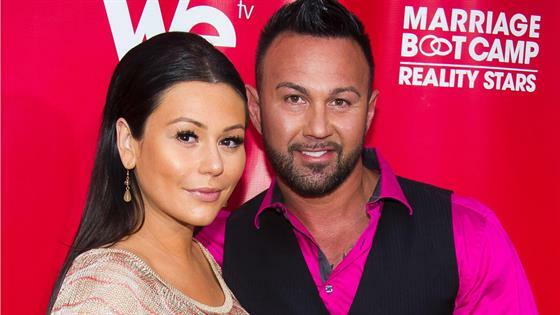 It's been a month since the world learned that Mathews split from Jersey Shore star Jenni "JWoww" Farley. It was a month full of Roger trying to woo the reality star into taking him back, despite him knowing full well that she "grew tired of the repetitive pattern that we fell into" long ago. But Rogers is not going down without a fight. In the aftermath of Jenni filing for divorce, Roger confirmed their breakup in a candid video shared to Instagram. "I am going to win my wife back," Roger said. "I'm going to win her affection back, I am going to win her love back. I have no intentions on being a single dad. We're in counseling so there is hope. It ain't over 'till the fat lady sings." And so far, the fat lady has stayed mum on the topic, with good reason too. A source previously told E! News, "Their relationship hasn't been healthy for a while, but even though Jenni already filed for divorce, it's still not totally over yet—there's a chance they could work it out and get back together." Jenni "JWoww" Farley's Ex Roger Vows to "Win Her Back"
Clearly, they haven't lost all hope since they continue to go on romantic dinners and spend time together as a family. Just days after Jenni filed for divorce they were seen with 4-year-old daughter Meilani and 2-year-old son Greyson at a show for the Disney Junior Dance Party On Tour in West Long Branch, N.J. The two sported enthusiastic grins for the outing, although Jenni went sans her wedding ring. Then, ahead of their 3rd wedding anniversary, the couple once again came together to celebrate the big day, much to the surprise of their followers. "Rome wasn't built in a day," he captioned a photo of them enjoying a candlelit dinner. And as the two finished their meal, a horse-drawn carriage decorated with pink flowers was awaiting them outside, much to the surprise of Jenni. "The horse, oh my God," JWoww said in shock. And if that wasn't enough to change Jenni's mind, Roger hoped his heartfelt message to her on the actual day of their anniversary would. He shared a photo of their glamorous wedding day and wrote: "This happened 3 years ago today. 8 years together total. 3006 days together. Not one of them was a flawless day. Not one of them would I change. Happy Anniversary Babe." If any of this has swayed Jenni, she isn't letting anybody know. The reality star has continued to keep her guard up amid Roger's charms. She recently jetted off to Barcelona, Spain with daughter Meilani, where they are relishing in the rich history and beautiful sights of the country. Mathews shared a photo of the four-year-old at a historic sight, with the caption: "Such a precious little diva enjoying her Spain vacation with Mom." As for the future of their marriage, that is TBD.